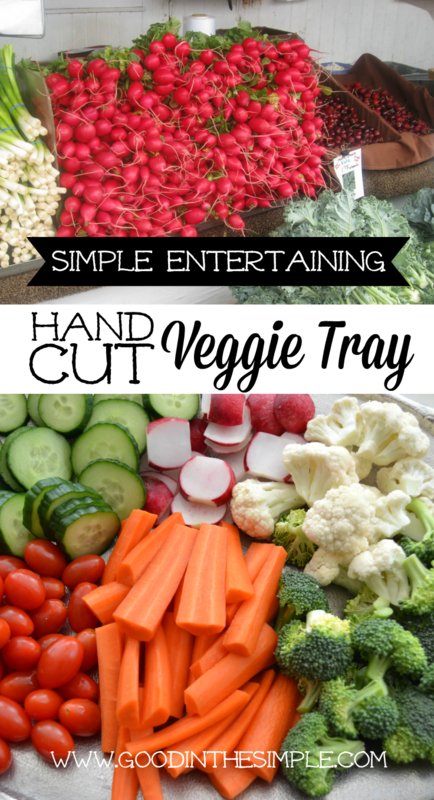 If you’re wondering what to take to a potluck, make your own veggie tray! It’s simple, healthy, and always gets eaten. There were times when I took the request to “bring an appetizer to share” as a personal challenge. Not wanting to tarnish my reputation as someone who loves to cook, I felt like I had to have the most delicious, most talked-about, most quickly devoured dish on the table. I would scour Pinterest and magazines for innovative recipes, and spend lots of time and money whipping up seafood dips, exotic cheese balls or delicate phyllo-wrapped concoctions. There were also times when I ran to the store en route to a party, grabbed some Tostitos and salsa, and stealthily dropped the grocery bag on the host’s table before darting away in shame. These days, I’m aiming for the middle ground. 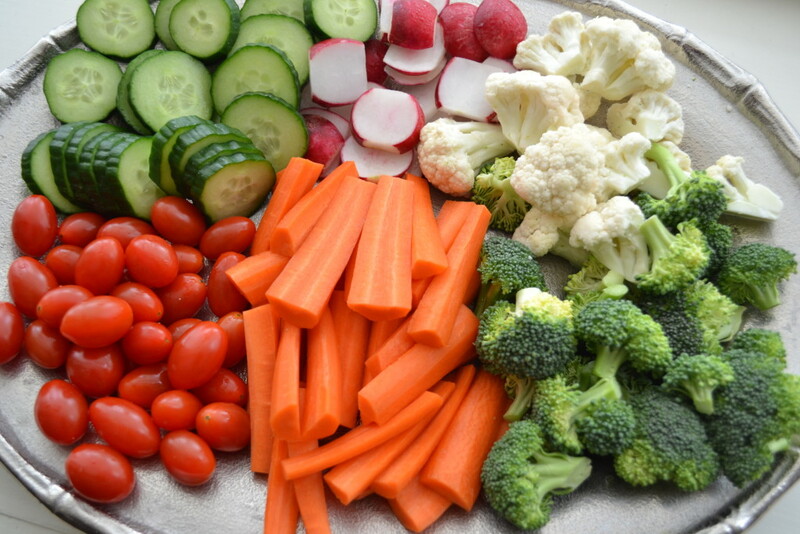 My current favorite is the tried and true veggie tray (crudite if you’re fancy). I know, I know…it’s so old fashioned and unoriginal and lame. But here’s the thing — it always gets eaten. No, it’s not going to be the dish people are fantasizing about the next day, but I think most people appreciate the opportunity to munch on a few fresh carrot sticks and broccoli spears in between bites of gooey dips and meatballs and other decadent party fare. Part of what’s given the veggie tray its bad reputation is the depressing state of most pre-made versions. I recently went to the grocery store with the goal of picking one up for a casual get-together, but as I stood there contemplating the browning cauliflower, whitish baby carrots and excessive celery (does anyone actually want to eat celery? ), I just couldn’t bring myself to buy it. I grabbed some fresh vegetables instead, and spent only about 15 minutes at home washing, chopping, and arranging them on a platter. The nice thing about making your own tray is that not only will it look better and taste better than one you can buy, but you can also customize it with vegetables people truly like to eat. Carrots are almost always the favorite and the first to disappear, so I include a lot of those. I know many people don’t like radishes, but I love them so I put them on my trays to be selfish. It’s really worth the extra effort to do the peeling and/or chopping yourself. If you think it seems like a big waste of time to peel and chop real carrots instead of buying the bagged baby ones, I beg you to do a taste test between a baby carrot and a freshly peeled and cut carrot. I promise the whole carrot is crunchier and tastes so much better. The same rule applies to other veggies, too. I recently bought some pre-washed and trimmed radishes and they were nowhere near as good and spicy as the ones that come with their leafy greens still attached. If you want to go the extra mile and get fancy, you could add mini pickles, olives, edamame, zucchini, snap peas, green beans, or anything else you like. Just buy or make some dip to go with it, and call it a day. It’s pretty, it’s healthy, and it’s simple. I feel good serving it to guests or taking it to an event, even as I’m crossing my fingers that someone else took the time to make buffalo chicken dip. I only sort-of like cooking, but I actually love chopping… I should do this more often! Definitely for my next book club. I think we all feel better about ourselves at a function if we have eaten something from the veggie tray.